Like Merchant Ships: One day! This has been a season of uncertainty for my family: a time to plant, or a time to be uprooted? ...into a kitchen garden with raised beds or a formal design. Pine tree shadows fall over the fence, so I don't have optimal sun. Our lot ends at the soccer goal. Above, garden gate at Travellers Rest. 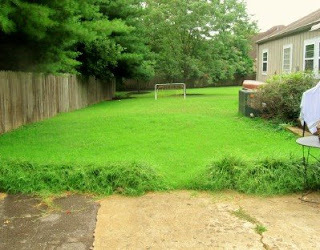 I'd love to maintain a glimpse of the neighbor's green lawn beyond. I can almost see a willow fence at each end, or hedge roses on either side of an old iron gate. Anyone have a frugal, fabulous idea for my space? I'd be so thankful! I've been lurking for quite a while now, and I have to say your blog is a daily inspiration to me. Our family is also in the middle of an ongoing outdoors project, including fencing. My husband acquired our antique iron fencing from someone who was replacing it with wooden stockade fencing. (The house was NOT in a nice part of town.) If you know someone with an older home who is interested in replacing the fencing, or is thinking about selling it for scrap metal, it may be a less expensive option. BTW, I laughed out loud when I read this post. I live 15 minutes away from The Rosemary House! I've never been there, but now I'll have to visit! Oh, it looks so fabulous! The Reppert family has come up with so many clever and creative ways to display and sell all things herbal. I'm thinking some fresh and dried herbs would do a lot to spice up my grocery store gifts this fall! Meredith, check on freecycle and yard sales for containers. I've found old wash tubs, LARGE pots (for fruit cocktail trees)and old windows to make greenhouses or help with growing seeeds. 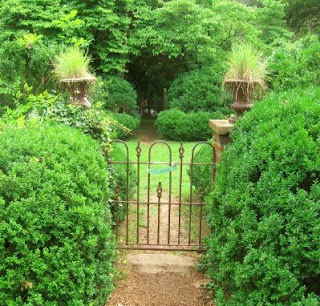 I'd catch a few episodes of P. Allen Smith's Garden Home on PBS. He always has fabulous ideas, and they are typically easy to replicate without a fortune. Begin making notes about how many hours the different areas of your yard receive full, unfiltered sun. These notes will be invaluable next winter as you plan. When a plant calls for 'full sun' it can't take even a skooch less than 6 hours to do its' best: bloom, fruit. To plant otherwise is a waste of time and resources. You can also begin NOW making delicious compost for next spring. Great kid project. Please plant BASIL. I can never find basil when I'm cooking in Tennessee! You could probably sell it. GARLIC is planted in the fall like any bulb, and harvested in early summer. Easy food to grow, fabulous when fresh, and great homegrown Christmas gift for foodies. BLUEBERRY bushes thrive in acidic soil, i.e., that area along the back fence under the pines. Use your raked up needles for mulch around them, too. And you know this intrinsically, but design in thirds...low, middle and tall elements. Roses are quite high maintenance. Up here where I am (Rhode Island), we grow lots and lots of hydrangeas - very low maintenance, beautiful, fill in quickly. I don't know if these would grow in your area, but they are also not particularly expensive. I bought two plants that bloom all summer (June to mid-September) for only $25 each. They grow to about 6' wide, so this is a great value. p.s. Depending on the hydrangea variety, some need full sun, part sun, or even full shade. You can customize a hedge of them depending on how the sun falls in that rea. I disagree with the anon who said roses are high maintenance. My roses are about the only thing I haven't killed in my garden. I'm in TX, and we often have drought conditions. My roses just keep on growing. They do have to be pruned and occasionally fed, but they're otherwise very easy. Oh Meredith - I just loved making a waddle fence with my husband - and it doesn't cost a penny!!! The only thing is, you have to know some one with some bush/woods/brush/forest area who is willing to let you go in and selectively cut a few saplings and take out all the green fallen branches and willow sprouts you need. We had an overgrown area to glean from and it was so fun dig a few holes, put in our gleaned posts close together and then begin weaving the branches, willow sprouts and whatever else we could find into our fence. It's a look that goes so well with a cottage garden or formal herb bed, and the possibilities are endless. It is quite a conversation piece too and everyone in the neighborhood who has the least bit of kindheartedness and imagination will be bringing you their fallen branches after a windstorm to see if you can use them for your fence! The best part is it ages gracefully, never needs paint and weaving in a 'replacement part' is easy as pie! It is heavy enough to support lovely climbers and makes a great background for kidlet pictures! Can you tell I like waddle fences? I forgot to say that we have had really good success with raised beds and the lasagna gardening techniques which are so very easy and inexpensive - if you start now, you'll have the most the most delightful soil to plant in come spring! Hi Meredith. I love to garden and combined with my love for "something for nothing", I have found that rooting plants is awesome! Hydrangia are very easy to root and grow fast as do gardenias. I strip off all but the top leaves, sometimes use rooting hormone, place in potting soil, and most important, put a glass canning jar on top. The canning jar is from the thrift shop, natch. Place in a SHADY area, keep it watered, and voila, new plants for free. i am too busy fending off envy at the size of your lot! we chose to live in one of the most expensive areas of the country and buying here means a small house on a small lot. i would love a small house on a huge lot! check out square foot gardening, by mel bartholomew. we are having great success with it! Freecycle and Craig List will often glean free plants, bricks, etc. Container garden gives you a lot of versatility and flexibility. One trick I have learned to help plants glorify in our southern heat and drought spells is to move the drainage holes an inch or two up the sides of the planters rather than the bottom. If you have your heart set on roses, knock out roses are an easy place to start. As you prune branches, cut them into three inch pieces, plant and cover with a mason jar to root new bushes. Azaleas also give some easy care color. Start snitching your neighbors bags of leaves and clippings left by the curb to build a compost pile.Winter sowing can give you an economical start for plants for spring. My best soil mix is actually simple- one part top soil ($1 bag from Lowes), one part composted manure ($1 a bag from Lowes) and one part homemade compost.I recommend Gardenweb for a priceless source of info an all things gardening, There are many kind, knowledgable folk there who love to help out. Sometimes I think the planning and choosing is as much fun as the cultivating.! We've been experimenting with Square Foot Gardens and enjoying the experience. Start small and expand. Consider sectioning off a composting area under the pine tree shade, our compost pile never did much until we situated it under our redwood tree and now it is "black gold" indeed. If you can't find the Square Foot book at the library you can check out www.sacbee.com garden section because their columnist is following that method & documenting it this spring/summer. It looks great! Good luck with the raised beds. You are brave. I would never tackle anything like that. Thumb not green enough. Having just gone through a whole fence controversy with our neighbours, I have some thoughts about fencing. Like you, I'd rather leave it so that it looks open and nice. But if your neighbours, now or later, are like mine then they are going to want some sort of barrier for the children so that they won't 'trespass.' [the quotes because it turns out my children weren't encroaching on their lawn but they were on ours! by 4 feet which really upset the neighbours!] This was a nearly 3 month experience! Personally, I'm okay with simple green chainlink for that purpose. It blends in yet keeps the open space. We had that old wood horse fence type fence, but the neighbours didn't find that acceptable. We had bushes and peony's planted along the fence line but again, not enough to keep the children off their property. Plus they didn't want to see our yard. So we have a full privacy fence now. And all the plants and bushes were wrecked in the process. Whatever you do, I recommend a quiet conversation with the neighbours first or be willing to accept that they might railroad over your choice later on! For us, WE put up fence to shield the sight of a monstrous blue above-ground pool and keep the neighbor's dog from darting through our yard into the busy street beyond. But we put in a nice gate so that kids can pass between for play. Former neighbors had no dog, kids or fun. At least our neighborhood is livelier now! Lots of good suggestions here. I have to second what gracemercyandpeace said about making notes. Lots of notes! You think you're going to remember things, but it's too easy to make mistakes that way. Obviously, you'll want to maximize your growing space, so either go vertical, or try the square-foot gardening that others have mentioned. Both great ways to get as much as possible from the ground you have. Larger pots (did somebody already mention that?) to grow tomatoes & even small fruit-bearing trees. These can be placed in the optimal sunny spots in your yard, even if it's not in the vegetable "neighborhood". I honestly don't think you'll regret trying to garden. So much beauty, the chance to exercise, teaching the kids about growing things, the pride that comes (the good kind!) of seeing the fruits of your labors on the table at mealtimes....all these reasons & more are why so many people enjoy it. It IS hard work sometimes, though. I mean, in June & part of July, I have to weed every single day. Things are pretty well able to take care of themselves by now, but it's a commitment, to be sure. One last thing I would say is to plant vegetables according to the way you cook now, & what you know your family likes. It looks like it will turn into a fabulous garden. Thanks for stopping by my blog! I try not to go to IKEA very often. Too dangerous. another beauty pause for me. so delighted you get to stay in your home and continue the sanctuary outside to His creation through your hands. blessings woman!